Hashimoto’s. It’s the number one cause of hypothyroidism, yet few of my Hypothyroid Mom readers have heard of it. Hashimoto’s. It’s more than a thyroid condition. It’s an autoimmune condition, yet thyroid medication is often the only treatment offered. Hashimoto’s. It’s a sadly common health condition that can come with all sorts of symptoms that doctors may mistakenly attribute to mental health issues. Hashimoto’s. It’s not all in your head. If you aren’t feeling well, it’s because thyroid hormone replacement medication doesn’t address the autoimmune component. Hashimoto’s. It’s possible to determine the root cause. It’s possible to reduce thyroid antibodies. It’s possible to feel well. Imagine looking into the mirror, but instead of seeing your sweet self, you see a creepy robber and then start punching yourself, and it hurts. That’s autoimmune disease — your immune system perceives its own tissue as an invader, then seeks to destroy it, little by little. With Hashimoto’s, the thyroid is affected. With rheumatoid arthritis, it’s the joints. With MS, it’s the brain and spinal cord nerves and so on. It’s a scary thought isn’t it that you could have autoimmune dysfunction even though you may not have been diagnosed with a disorder yet. If you take my article to your physician today, they’ll tell you autoimmune disease is “rare” and here I’m saying I think all of us have some degree. I’m not crazy. We all have some degree of autoimmune disease whether or not we know it and I say that becuase we are constantly inhaling, eating or exposed to something that is NON-SELF. We may have pathogens inside us, we may have been exposed to some type of mold or yeast, or environmental pollutant or pesticide. We ingest probiotics from cow species and our babies drink milk from soybeans sometimes (both non-human, non-self). Do you see my point yet? We sometimes have compromise to our immune system or allergies to dust, pets or dander, spices, medications or flowers, seeds, fruits and on and on. The list goes on, all these things are NON-SELF. If our immune system does what it’s supposed to do, it sees things that are NON-SELF and it tags it with a special immunoglobulin. My point is not to convince you of this, but instead to show you that we are all encountering things that are non human, things that could easily trigger autoimmunity and we don’t even know it. It’s only “rare” because our old-school tests can’t detect it until 90 percent of the tissue or organ is completely destroyed. That’s how stupid our health care system is. Lab testing for many autoimmune disorders are so backwards that until the symptoms are out of control and you’re in terrible pain or finally starting to become disfigured (like knuckles in Rheumatoid for example), the tests don’t come back positive. Most of your tissue has to be destroyed or the autoimmune diagnosis is not given. High levels of thyroid: You are nervous, hyperactive, anxious, you may have a rapid pulse, heart beat irregularities, diarrhea, feeling waves of warmth, you may sweat and have other symptoms where things feel speeded up. Remember, thyroid is a gas pedal in the body, it makes everything go (excessive amounts will cause diarrhea). Low levels of thyroid: There are dozens of symptoms, basically everything is slow, you may have slowed thinking, slurred speech, brain fog, trouble word finding, chronic fatigue, weight gain, constipation (slow transit time in the gut), you may feel cold, metabolism slows so you put on weight (or you can’t get it off). What’s the cure? But people don’t get cured when they take the “standard of practice” medications such as thyroid hormone drugs, or even after they undergo painful surgery and radiation treatments. This should cure you right? Wrong. Months to years later you go on to develop another autoimmune disease that targets another organ. When you have one autoimmune disease, you almost always have two or three or four. Most people have “multiple tissue antibodies” but they wouldn’t know it. So why aren’t people cured and why don’t they feel better when their TSH and other thyroid labs look good… and they go through all the gold standard treatments? The answer is almost common sense if you think about it. Let’s stick with thyroid illness, even though you can apply this to any other condition like psoriasis, MS, Lupus or Rheumatoid, etc. For my example on thyroid autoimmunity, it’s because NONE of the thyroid replacement meds block the assault caused by your T cells. They just replace absent thyroid hormone. The T cells (your immune system) are still going full force and trying to kill tissues in your body. If you had a thyroidectomy, they go and try to kill other tissues in your body. You’re still hosting a bad party. You gotta get the thugs OUT! There’s a full-body cytokine storm of pro-inflammatory compounds and free radicals that are contributing to symptoms (even though your hormone levels are okay). Hashimoto’s will cause your immune system to eat away at your thyroid gland until it’s basically dead. That’s the shocking truth that physicians don’t usually tell you, they just hand you a prescription for thyroid hormone replacement medication and take the “wait and see” attitude. While they’re waiting and seeing, and testing your TPO antibodies periodically, your thyroid hormone levels will swing high, then low, causing you to get misdiagnosed with a variety of emotional disorders such as anxiety, depression, bipolar, insomnia or panic attacks. When thyroid hormone is low, you will be fatigued, sad and cold. When thyroid hormone swings high you will feel anxious, irritable or experience rapid heartbeat and panic attacks. You might even get simultaneously diagnosed with Graves’ disease. Most often the thyroid antibodies for Hashimoto’s – Thyroid Peroxidase Antibodies and Thyroglobulin Antibodies – are not tested and the person has no idea they have Hashimoto’s and they are suffering. Even when the correct diagnosis of Hashimoto’s is made, there are treatment failures galore with thyroid medication. Conventional doctors will say there’s no cure for Hashimoto’s or any autoimmune disorder and the best you should hope for is to put it into remission. I disagree. Many of you still continue to have symptoms despite thyroid hormone replacement medication. It’s because there is more to Hashimoto’s and that’s the autoimmune fire burning inside you. I want you to realize that the number one way to help Hashi sufferers is to avoid food antigens as best you can. Something upsets your thyroid gland, and causes the antibodies to rise. You have to determine what that “something” is. For most, it is dairy or gluten but can also be soy and lots of other grains. Here’s why you have multiple diseases going on: gluten is a hole puncher. You get gluten when you eat traditional bread, pasta and pastries, most notably from foods cooked with wheat, barley and rye. It’s everywhere. It’s an additive. Gluten pokes holes in your gut, whether or not you have Celiac disease, no one is special or immune. Gluten (as well as dairy) makes your “tight junctions” in your gut come loose, so other undigested proteins leak out of the gut, and into your blood stream. The proteins aren’t supposed to be in your bloodstream, they’re supposed to stay in your tube (your gut). But now, because gluten is a hole puncher, these proteins are all over your body and they’ve lodged in many different organs. This is just one mechanism, and I’ve simplified it tremendously. Your immune system has the job of tagging these foreign proteins which are kind of innocent, they only leaked out because your gut is leaky. By the way, if your gut is leaky, so is your brain. These proteins are in organs and your immune system is poised to destroy the tissue wherever they lodge. 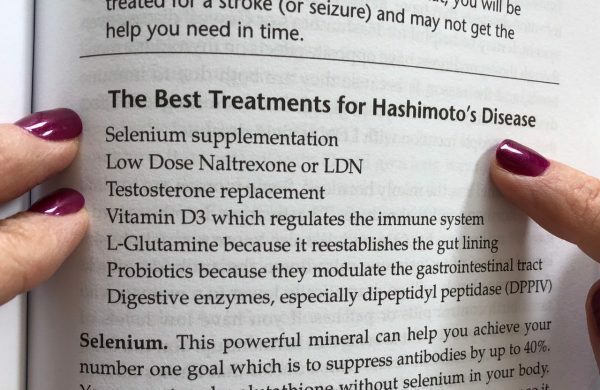 You can see from this image from my Thyroid Healthy book that there are many additional useful treatments to help with Hashimoto’s, such as selenium, Low Dose Naltrexone (requires prescription), vitamin D, glutamine, probiotics, and digestive enzymes. Just a warning about glutamine, too much of that will cause excitotoxicity as it may begin to convert to glutamate so even though it’s great for the gut lining, be careful with it, especially if you are prone to anxiety. Vitamin D is important for immunity, everyone knows that. But you may not realize that a deficiency from taking a statin or from poor sun exposure can increase your odds of Seasonal Affective Disorder (or depression), as well as flare ups in Hashimoto’s. 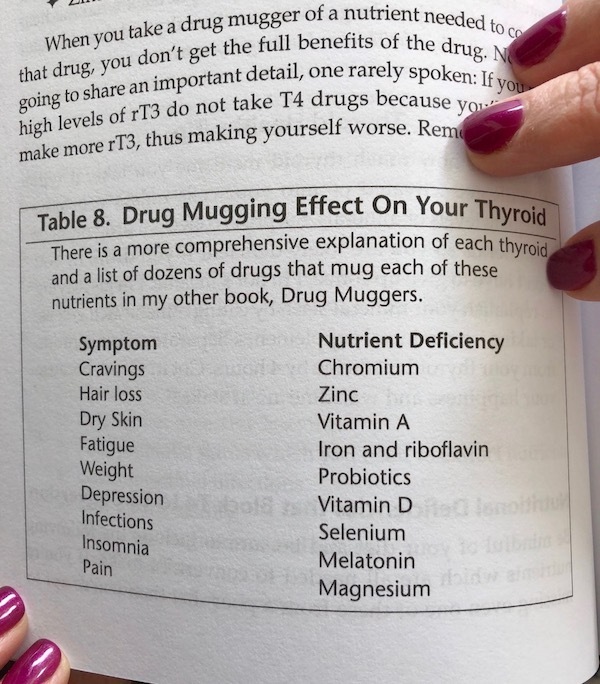 There are “Drug Muggers” of nutrients and the deficiencies of these nutrients will cause more symptoms of hypothyroidism. Hydrogen peroxide is all over your body. Your cells produce hydrogen peroxide naturally every single second as part of cellular metabolism. Your body is supposed to turn that hydrogen peroxide into water and oxygen, but with Hashimoto’s, that process could be hindered, and then the peroxide builds up. This build up of hydrogen peroxide may increase the level of TPO antibodies (Thyroid Peroxidase Antibodies) in your bloodstream. Without enough rust removers like Catalase and Glutathione, the hydrogen peroxide builds up like poison, and it causes your hair and skin to lose vibrancy and youthfulness. It causes peroxidation of your lipids, meaning you get dangerous cholesterol levels and broken cell membranes. Hashi sufferers often have an enormous amount of “lipid peroxidation” which is a scientific term describing the destruction (or peroxidation) of fatty cell membranes. The hydrogen peroxide that your cells make are like acid to your cell membranes. Catalase directly breaks down hydrogen peroxide, rendering it harmless, turning it into water and oxygen so it can no longer destroy your cell membranes and mitochondria. We all make the enzyme Catalase in our liver, but our bodies may fail to produce sufficient amounts of the enzyme Catalase to break down the build up of hydrogen peroxide. Bringing down excessive hydrogen peroxide is a key to getting well with Hashimoto’s, yet it receives very little attention. The enzyme catalase is not the only way to clear the hydrogen peroxide buildup associated with Hashi’s. There was an interesting article published May 2017 in THYROID, The Official Journal of the American Thyroid Association. Researchers evaluated participants with Hashimoto’s. They looked at various biomarkers especially iron (in menstruating women), selenium, and vitamin D status. They found that selenium is essential to thyroid action. And the reason was that the selenium helped form glutathione which … and I’ll quote them, “protect the thyroid by removing excessive hydrogen peroxide.” Their study suggested that some selenium would be helpful, especially in iodine-deficient areas. The researchers recommended about 50-100 mcg per day. They also recommended that clinicians check patients’ iron (particularly in menstruating women) and Vitamin D status to correct any deficiencies. Identify and remove food sensitivities. Gluten and dairy are the big ones for Hashimoto’s but triggering foods may also include sugar, alcohol, soy, caffeine, eggs, corn, gluten-free grains (including buckwheat, millet, quinoa, and amaranth), nightshades (including peppers, tomatoes, potatoes, eggplant), beans, and nuts. You can try to eliminate certain major foods known to cause sensitivities for a set number of days (say 30 days) then reintroduce one at a time to see your body’s reaction or test for food sensitivities. Love your Liver. You naturally make catalase in your liver (and that’s the #1 enzyme that clears hydrogen peroxide) so liver health is important. Minimize liver-damaging substances where possible. As an example, alcohol can harm the liver, so reduce alcohol consumption. Milk Thistle is a natural herb that can revitalize the liver. A note of caution, if you are allergic to ragweed, chrysanthemums, marigolds or daises, you may be sensitive to milk thistle too. Our bodies are all different and we may have sensitivities to supplements too so speak to your doctor always about new supplements and start new supplements one at a time to watch yourself for adverse reactions. Protect yourself from Acetaminophen liver damage. Acetaminophen (including Tylenol) is one of the leading pain relievers in the world. It’s probably in every medicine cabinet (including mine). Chronic use of acetaminophen, even in regular dosages, taken over a few days, or a few weeks can cause liver damage for some very sensitive individuals, and it’s hard to know in advance who you are. The mere ritual of drinking wine with dinner and then taking acetaminophen-containing pain relievers will silently strain your liver to the point of injury. Many years ago, probably in 2001, I warned my readers to take a certain supplement called N-Acetyl Cysteine (NAC) if you needed to take acetaminophen routinely, in order to protect your liver and restore glutathione levels. Glutathione is an antioxidant that has anti-cancer activity. I was right about NAC, and today, years later, conventional physicians are starting to recommend NAC too. Reduce your toxic exposure. Consider buying organic fruits and vegetables to voice herbicides and pesticides. Be careful to select fish with the lowest possible mercury content. Avoid processed and canned foods. Use safe cookware and bakeware free of aluminum. Filter your drinking water from chlorine, fluoride and other harmful chemicals. Use fluoride-free toothpaste. Remove toxins from the air with a high quality air filter. Use toxin-free beauty products, cleaning supplies and personal care products. Find daily ways to gently detox including infrared sauna sessions, skin brushing, hot yoga, regular exercise, and massage. Include Selenium. Selenium protects the thyroid by removing excessive hydrogen peroxide. Selenium is found mainly in high-protein foods such as meat, fish, shellfish, eggs, and Brazil nuts. The content of selenium in foods is dependent on the soil concentration of selenium which is very low in some areas. Studies have shown that oral administration of selenium decreases serum TPOAb (Thyroid Peroxidase Antibodies) and TgAb (Thyroglobulin Antibodies) and postpones the development of hypothyroidism. [2,3,4] Selenium is essential for proper synthesis, activation and metabolism of thyroid hormones. Selenium taken preventively should be taken at 100 mcg once daily. If your levels are low, however, I recommend shooting for 200 mcg total daily from a high quality supplement like this one. Read the labels of your supplements including multivitamin for selenium to ensure you don’t exceed the daily dose of 800mcg/daily as this level can be toxic. Ensure your doctor checks your iron (particularly in menstruating women) and Vitamin D status. Studies show that low vitamin D status is associated with Hashimoto’s and that Vitamin D supplementation reduces thyroid peroxidase antibody levels. [5,6] Iron and Vitamin D should be tested regularly to determine the ideal dose of supplementation because excessive supplementation of iron and Vitamin D can be toxic. Get a second or third opinion because each physician has a different toolbox for treating Hashimoto’s. Get your thyroid tested properly. I recommend thyroid lab testing include Free T4, Free T3, Reverse T3, Thyroid Peroxidase Antibodies (TPOAb), and Thyroglobulin Antibodies (TgAb). Get a copy of your own test results. Check that your results are optimal using this chart from my Thyroid Healthy book. If your doctor says, “Your thyroid is normal.” Don’t settle for that. Get a copy and make sure all the right tests have been run and that your levels are “optimal” not just “normal”. There is a big difference. Ask for a trial course of thyroid medication even if your thyroid lab test results appear normal or high. 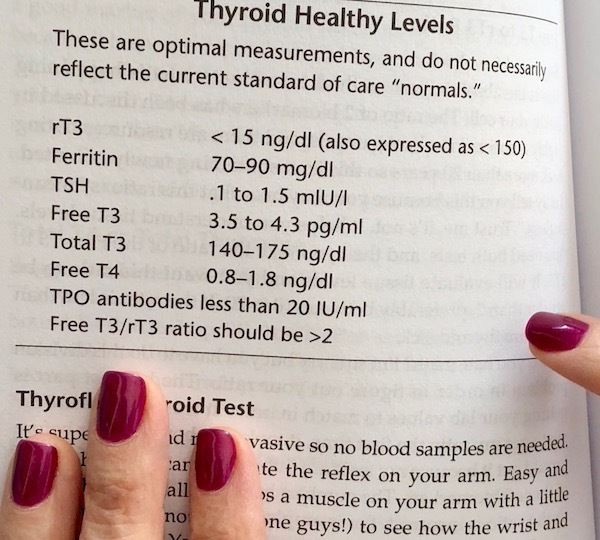 Remember, as your antibodies are killing off the thyroid gland over time, your body dumps some of the thyroid hormone into your serum, so this means your labs will cause you to show higher T4 or T3 on the test. Your thyroid hormone levels will swing high, then low, and back again which may result in misdiagnosis based on thyroid lab test results. If your doctor immediately attributes your symptoms to emotional disorders such as anxiety, depression, bipolar, insomnia or panic attacks, seek a second or their medical opinion to find a physician well versed in the treatment of Hashimoto’s. Uncover chronic infections. Infections are often an overlooked trigger for Hashimoto’s. Common infections associated with Hashimoto’s to check include H. pylori, Yersinia enterocolitica, Epstein-Barr Virus, Hepatitis C Virus, and Borrelia Burgdorferi (the bacteria that causes Lyme disease). Registered pharmacist Suzy Cohen has been a health writer for over 15 years. Her syndicated column, Dear Pharmacist, reaches millions of readers each week and you may have also seen her blogs on The Huffington Post. She has spoken on programs such as Good Morning America Health, The Dr. Oz Show, The 700 Club, The View and The Doctors. Hu, S. and Rayman, M.P. Multiple Nutritional Factors and the Risk of Hashimoto’s Thyroiditis. Thyroid. 2017 May;27(5):597-610. Turker, O. et al. Selenium treatment in autoimmune thyroiditis: 9-month follow-up with variable doses. J Endocrinol. 2006 July 1;190:151-156. Pekar, J. et al. Effect of selenium supplementation in thyroid gland diseases. J Elem. 2017. 22(1):91-103. Mazokopakis, E.E., et al. Effects of 12 months treatment with L-selenomethionine on serum anti-TPO Levels in Patients with Hashimoto’s thyroiditis. Thyroid 2007 Jul;17(7):609-12. Kim, D. Low vitamin D status is associated with hypothyroid Hashimoto’s thyroiditis. Hormones (Athens). 2016 Jul;15(3):385-393. Chaudhary, S. et al. Vitamin D supplementation reduces thyroid peroxidase antibody levels in patients with autoimmune thyroid disease: An open-labeled randomized controlled trial. Indian J Endronine Metab. 2016 May-Jun;20(3):391-8. I’m not sure how many people this comment will reach/help, but I want to share my experience with something that is not discussed as often in regards to Hashimoto’s: mold. I was diagnosed with Hashimoto’s in 2016. I have never been “healthy”, but things got really bad after living in several apartments with mold problems. At 26 years old, I had to quit my job. I was having headaches and light sensitivity that made it difficult for me to even be in a room with lights, not to mention a slew of other symptoms that I won’t get into in this comment. I spent most of 2016 in bed. In 2017, large patches on the left side of my body suddenly went either partially or completely numb. I had been forgetting how to spell very basic words. I had a lot of doctors, and none of them had a clue what was causing all my debilitating symptoms. At some point, I noticed that I was having worse symptoms after eating certain foods, but couldn’t figure out what they had in common. For a long time, corn was the main suspect. Eventually, I figured out that I was reacting to everything made or processed with citric acid. Commercial citric acid is made from Aspergillus Niger (a type of mold). While the mold itself is filtered out, It’s my understanding that the mycoxins cannot be, as they are too small. Citric acid is often not labeled, and it used for EVERYTHING – to refine/cold extract many oils, to make many dairy products, as a labeled (and unlabeled!) preservative in foods, in vitamins (such as calcium citrate), as electrolytes added to bottled water (sodium citrate)… even sea salt can contain anti-caking agents that are made or processed with the stuff. Many foods are processed with it (pectin, for example). It can also hide in other unusual places – I had to stop drinking Puerh tea last year after a nasty reaction. Some research into production verified that Aspergillus Niger is used to ferment the leaves. After moving, removing trigger foods from my diet, and buying 2 very nice hepa filters that run almost 24/7, I have been doing much better. Within days of getting the air filter, a lot of the feeling returned to my nerves. Some of the more stubborn areas took much longer – the places that went numb first took almost a year for the feeling to return, and they still go partially numb for a bit during flares. I hope someone can benefit from this information. I know this is a very long post. If it helps even one person, it will have been worth it to me. I am a fan of this website, and I hope that by sharing here, I can increase our colllective knowledge of Hashimoto’s (and autoimmunity in general). And to whoever is still reading this, thanks for your time! I wish you the best. I forgot to explain how this story relates to my thyroid sepcifically. Consuming a trigger food causes my thyroid to swell up A LOT. After I was diagnosed, I was amazed that I wasn’t diagnosed sooner. My thyroid was huge! I can’t take medication. I have tried several times. It always causes problems with my heart :/ so it’s definitely not medication that has brought down the swelling. I posted this story here because I often wonder if mold exposure is something that causes the hydrogen peroxide to build up. The body uses glutathione to remove mycotoxins, so excessive expsoure supposedly can deplete it. I also found a really interesting article that mentioned mold’s ability to “turn off” expression for the gene(s) that code for glutathione production. My personal experience is that taking milk thistle helps a lot with my symptoms. I personally don’t notice much difference with capsules; tea and extracts make an enormous difference. Again, hope this helps someone! I just added NAC to my supplements and found this site doing further research. The past 7 months I have just felt off; stubborn weight gain, trouble sleeping, nearly constant post-nasal drip, and frequent sinus infections. I work in a portable at a school as a teacher’s aide. Yea, mold exposure. I was just diagnosed 2 weeks ago with mold infection in my sinuses. At the same time I had new blood work for my thyroid and a number of other issues. Everything was weirdly off. Some numbers higher, some lower. I was given an anti-fungal and silver nose spray. I can already tell the difference. Yes, I fully believe the mold infection effected so many things. If you google mold exposure in portables in schools it’s a nationwide problem that is often swept under the rug – costs too much to address. It’s pretty scary and dangerous. Best of luck to your continuing fight to get well. Hello , I was 14 when I was diagnosed because I was accused of eating to much fast food . You can not drive at 14 I ate everything the rest of the family was served but it slowly climbed up and so did the weight till I was on the highest synthroid . I then decided to ask my doctor about cytomel along with a gluten free diet . I have not lost much weight but I have dropped my prescription to 200mcg to 112 with taking catalase and small dose of cytomel twice a day . I had my d looked at I take 1 a week and b-12 and b-6 to help with iron levels . Thank you this article sparked hope ! I’m now 46 and happy ! I just read your article on Hashimoto’s Disease, where certain Pure Encapsulations products were recommended. Do you have a brand you recommend for Chromium and for Catalayse? I would like to add those two to my protocol. Great article, and I will be sharing it with my Doctor at my next visit. Thanks for sharing the information with all of us! Oh my I just read this article and it scares me to death. I was diagnosed in January 2018 with Cushng’s Disease. In March 2018 I had a very large tumor removed from my pituitary gland. A couple of weeks after surgery my doctor told me I had hypothyroidism and started me on Levothyroxine, Vitamin D and Iron supplements. He never even described what hypothyroidism is to me. I have suffered with depression and anxiety/panic attacks for many years. After having this surgery the depression and anxiety continued. I asked the Endo. Doc. and his words to me were. You have psychological issues and need to see a psychiatrist. The last time I saw my Endo. Doc was in September 2018 and he does not have me rescheduled to see him again until March 2019. I have been seeing a therapist and psychiatrist eight months now and have tried many meds. He says it appears that I am medicine resistant (meaning no meds work). He wants me to have a procedure done in his office called TMS to see if it will help. I cry every day and have for years. My joints ache all over and I am supposed to be starting PT in February. I say all this to say that my Endo. Doc was highly recommended to me in B’ham, Alabama. Because I have health anxiety your article has me questioning whether I need to see someone else for another opinion. I am all alone and have no support from extended family. I would have absolutely no idea of who else to go to see for a second or third opinion. I am so frightened that I may not be getting the correct attention or medications. What is your diet like? Are you a wheat eater? I gave up all grains and sugar (processed) and have never felt better in my entire life. The aches and pains, fog all disappeared. Praying for you! The book “Stop the Thyroid Madness” by Janie Bowthorpe is a good place to start. She also has a facebook page and you can sign up for her newsletter on her website. That’s where I started many years ago. The Thyroid Pharmacist, Isabella Wentz, also wrote a book because she has thyroid disease and passes on her great knowledge in her books as well. Knowledge is power. Good luck! I have Hashimotos and was diagnosed years ago…I never feel well. My left lobe is enlarged and hardened somewhat which I knew I had a nodule but it has grown. My last TSH was 25.7 and I felt like I was dying. I have chronic cystitis and read that can be caused from thyroid as well. Anyway I get an ultrasound soon and bloodwork done again soon. I still feel horrible. That was about 3 weeks ago on my labs. There are always dietary links to our health issues. Don’t be misled by people or professionals who would lead you otherwise. Although this author gives some dietary advise, I wonder where she got her medical degree. As an Endocrine Nurse for 30+ years, Hashimotos is an auto immune disorder, has a genetic component, as well as gender preference (women are more prone). According to American Medial Society and textbooks based on Science, there is no dietary link. I have Hashimotos and other than my thyroid meds I control it with diet. When I break my diet I feel horrible. I have also been told this by doctors and nurses and other hashi patients. There is a dietary link to everything . Tara, I have gotten all of my thyroid #’s into the optimal range by making dietary changes (especially eliminating gluten and dairy and maintaining a low-glycemic, anti-inflammatory diet) and correcting nutritional deficiencies. Thankfully there are people like Dana helping us take control of our health. Even many mainstream doctors now understand and see in the research that there are dietary links to autoimmune diseases. An “endocrinologist” didn’t test for antibodies, nor find my Hashimoto’s. A D.O. integrative physician did. An endocrinologist ignored my ongoing symptoms by testing only my TSH. The only thing that has improved my condition is strict adherence to a gluten/grain free diet, Armour Thyroid or Nature-throid, Low Dose Naltrexone and exercise. Don’t be fooled by modern medicine. They know nothing if they don’t listen to their patients when they continue to have symptoms. I am a person who demanded to be tested for a thyroid condition due to ongoing female issues that my then gynecologist just “masked” by prescribing every type of BCP on the market. After the blood work came back as hypothyroid, that doctor said “We don’t say this all the time, but you were right.” Don’t put your health and well-being into someone else’s hands completely if you know you still do not feel well. Look elsewhere! And I agree that food has everything to do with causing/curing disease. I’ve been told for years to get tested for food allergies. I see that our bodies are failing (genetics) causing the food allergies, not the allergies causing our bodies to fail. But, once the cycle is broken, we chase the food allergie symptoms and vitamin deficiencies to get some relief. I say this because my disease has continued to advanced that by now (16 years post-diagnoses) my food allergies are numerous (soy, egg, dairy, barley, rye, wheat, beef, pork, and tomatoes), my body is failing more, and my family recently found our about a rare genetic cancer that’s plagued generations of our family. The science finally got there! I am Hashi, chasing the food allergies and supplements for relief, but now I am developing chron’s. My family had a history of gallbladder issues, but now we know we are carriers of this rare genetic colon cancer too. The science isn’t there yet, but who’s to say that deviants of are genes are not the cause for failing guts and immune systems that in the end lead to food allergies? i was diagnosed with cancer and 24 hours later changed to Hashimotos. I opted to have thyroid removed which i now know was probably a mistake. i take 125 mcg synthroid. I was advised by my holistic practitioner to reques trying Armour thyroid. She feels it is less harmful to my body. Do you have an opinion on that!